Referral sales script and prospecting scripts. Home > Scripts for business > Referral scripts "Ask for referrals"
Referral scripts are for written to "Ask other professionals for referrals." Sales professionals who want the most cost effective way to build their business is to use a referral sales script. 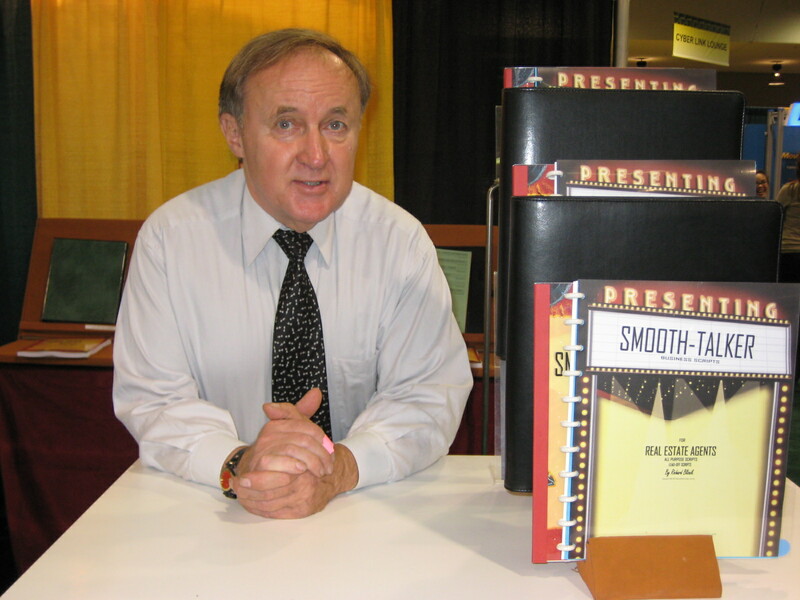 Written for all types of sales & marketing positions that require the sales professional to make their own prospecting calls to get referral business. Having the right words to say is critical when asking a professional to send you a referral. They are ready to use right out of the box. and a 24 page Instruction book and a "Script-writing" kit. Building your referral business depends on having the right things to say to someone so you can build trust and have a good relationship. 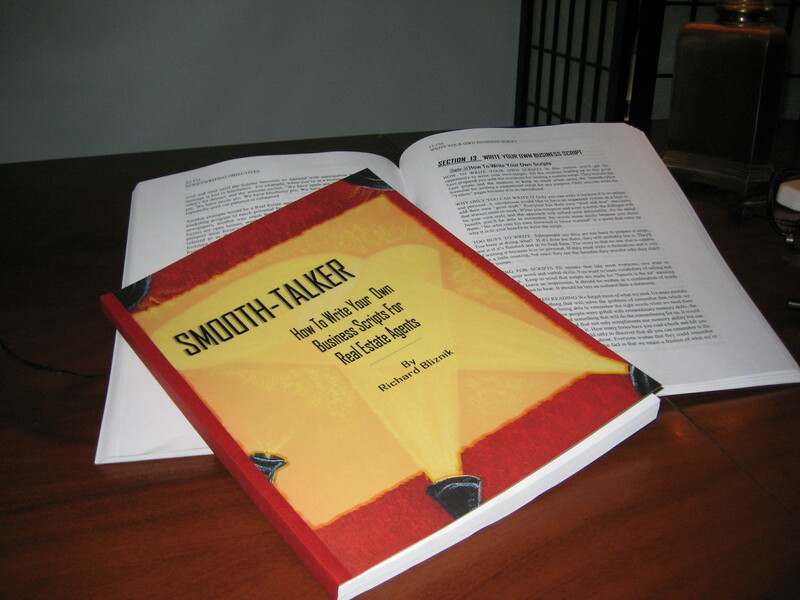 Smooth-talker scripts for building referral business has written a referral script that address the problems. Referral scripts work for all professions. Building referral business is the hottest topic in business development. Long term business comes from building referral business through prospecting. It is a slow process. To get referral business you need to establish a relationship with other professionals in your area and simply ask them to think of you when they come across a person who is an ideal candidate to buy your product or service. You must make it easy for other professionals to send you a referral by keeping your name and professional profile in front of them. Calling for getting referrals using the telephone is the best connection that can be made. You can ask for referral in person and you get immediate results. It works better then any other method. You choose the time to make the call to the people you wish to do business with. You can prospect at any time. Everyone still uses the telephone to get referral business and direct calling is not about to be replaced anytime soon. Salespeople aren't comfortable asking other professionals for referrals. Sales people rationalize and have thousands of excuses to avoid the possibility of appearing to have a weakness. Instead, they just do not prospect for referrals. We take the path of least resistance by not picking up the phone and making a prospecting call. Using a referral prospecting script is by far the "most cost effective method" of business development and lead generation. The reason why a referral customer is the most valuable you can get is that they come to you without having to spend money to generate them. Referral customers come highly recommended so the customer perceives you to be qualified to handle their business. You have no competition when you get a referred client because no other salesperson knows about them. The referral client is generally prequalified by the person who guides them to you. You know they are serious because they have talked to someone about their willingness to buy a product or service. Prospecting scripts for referrals were written to help salespeople build their business by saying the right thing to a referral source asking them to send your referrals. Scripts for referrals were written as a result of discovering that sales professionals have difficulty with asking others to help them build business by exchanging referral clients. It may take time but the results are well worth it. 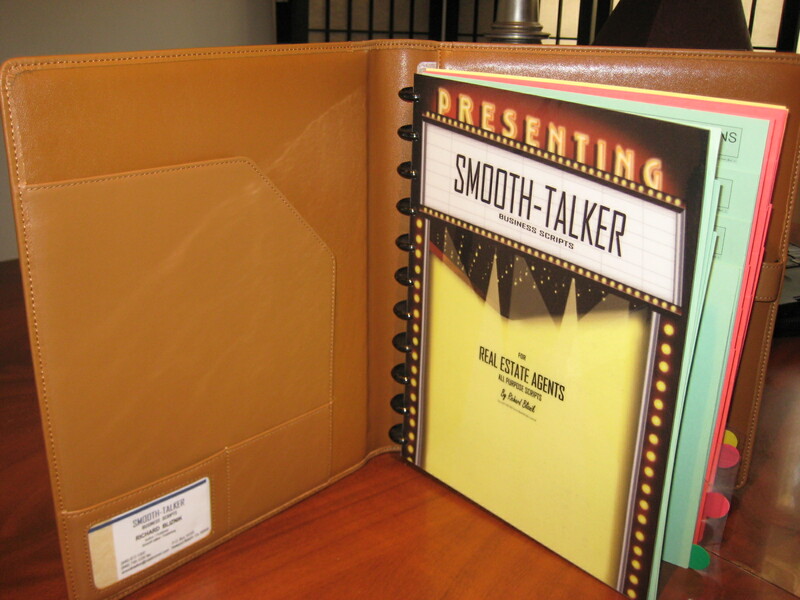 and an up-grade to a Genuine Leather portfolio. Own Sales & Prospecting Script"
I wrote every word of the referral scripts that I publish. I didn't use (steal) other people's version of the dialogue. The scripts were written as a result from making tens of thousands of prospecting calls. After being a real estate broker, sales manager, and trainer for a 60 agent office for over 38 years, I learned that salespeople resisted (hated) make prospecting calls. Not having a written script was to reason because they couldn't remember what to say to a prospect. Having a well thought out script for referral fees will guarantee that they will send you referrals. With all the types of social networking available, it behooves you to ask for a referral. Getting referrals through prospecting is the most difficult thing a sales-professional does. Use a referral script will help you overcome the obstacles. A well written script for getting referrals gives you many ways to say something instead of just one way. Scripts for referrals insures that salesperson give the same uniform message, guarantees, and policies that the company must stand behind. When you are skillful with the words learned in business training using sales training scripts, you don't have to constantly sell, use pressure, or be manipulative. 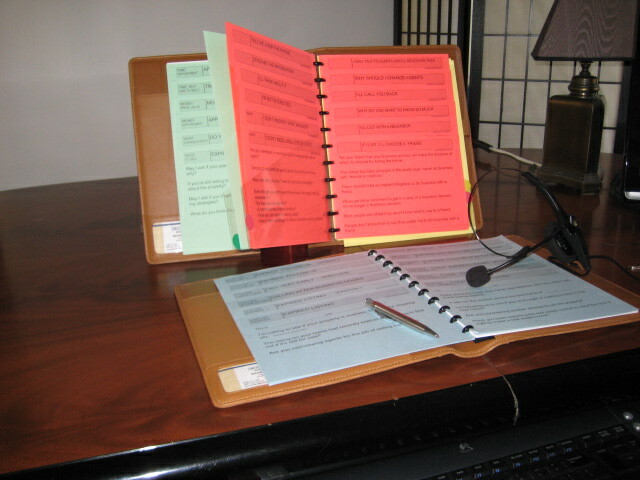 Smooth-talker scripts for referrals were developed to cope with the highest stress activity of the business world, that of making a call to ask for referrals. Approaching a person you have never met is difficult enough, and asking them for future business referrals isn't their first priority. Unless you have good reasons for them to send you referral business, you are just like any other salesperson who calls. It was difficult to write the referrals script. 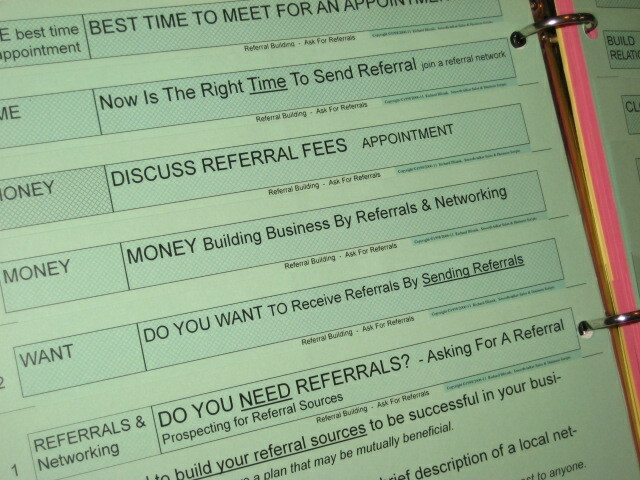 It was an extremely difficult to write a referral script because it not like prospecting to sell a product or service. The usual dialogue didn't apply. "Fear makes us a coward" is a quote mentioned by trainers and sales managers for the low threshold that causes the fear. It is a fear of conflict and disapproval to which it is easier to retreat to a comfort zone protected from hostilities where we are safe. Calling someone to get referrals is highly stressful. We can't remove all of your fears. Accept the fact that there will be some degree of fear you will experience. We can't remove all of your fears when making telephone prospecting call. You're not human if you don't have any fear. Having a script for referrals will keep you from avoiding the telephone call in the first place. Over time we developed all sorts of personal scenarios that we keep playing over and over in our mind. Sales managers agree that most people are uncomfortable meeting someone new. Deeply imbedded in our sub-conscious is the naturally occurring instinct to avoid anything that causes mental pain. To acheive success, you must be comfortable meeting new people even though you may face the fear of rejection. Acknowledge your fears and just make that call! Acknowledge the fear and examine it, and then it can be handled. You won't let a gruff voice or a bad attitude of a prospect keep you from your goal of becoming successful in generating new business. It's like walking through a minefield. Salespeople want everything to go just right but they don't like controversy because they feel it's like walking through minefield. Sales people avoid controversy by "giving up" prematurely and ending a call. Hostility from a prospect is reason enough to end the call. People don't say the same thing twice. Salespeople asking for a referral never say the same thing twice, consequently they don't get good at what they say. It really boils down to feeling that you won’t know what to say therefore if you avoid the telephone call to the prospect, you’ll rule out the possibility of feeling bad. Fear of disapproval is a close cousin to “fear of rejection." We are all emotional beings and not intellectual beings. 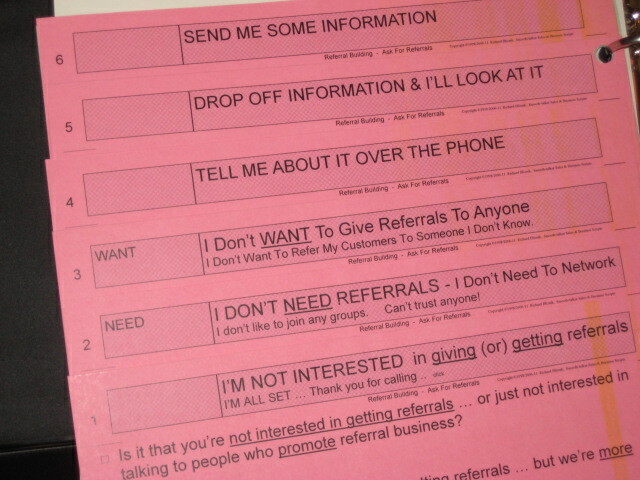 Below is a list of the page headings for the referral prospecting scripts. Each page has 5 or 6 lines of dialogue that are an approach to the heading. GREEN 24 pages of scripts that means you are doing the talking & conversing about the following. The dialogue identifies you, gives a reason for the call, and states a brief message. Building our business by asking for referrals. Invite you to a referral workshop. Explain what a rererral network is. Share ideas to build referral business. My plan to build a referral network. Referral from a person who knows you. Do you have someone to send referral to? I'm looking for professionals to recommend. Follow-up call after a recent mailing. I'm Forming a referral network. Things that you should ask a prospect. Does the prospect Need referrals. Now is the right Time of join a referral network. Do you Want to receive referrals. Discuss Money & referral fees. Have You Made A Decision. Discover Potential For getting referrals. Close On Services & Best Values. Commitment to send me referrals. Explain what a referral partner does. Take The Next Step to exchange referrals. Respond with up to 6 responses on each page. Each 1-liner offers a different approach to an objection. I don’t need referrals. I don’t want to send referrals. Not interested in getting & giving referrals. Not interested unless the referral fee is right. I don’t want whatever you’re selling. I don’t trust salespeople. Do you have a referral to send to me? How do I know this isn't a "Scam." I can get lower referral fees. Do you have the lowest referral fees ? Others will cut their referral fees. Will you cut your referral fees? Friend in the business - has similar services. Why should I choose your referral network? Why should I change referral sources? Why are you calling? I get a lot of calls about sending referral. I Had A Bad experience with referrals. YELLOW pages contain the traditional selling language & the reasons to do business. 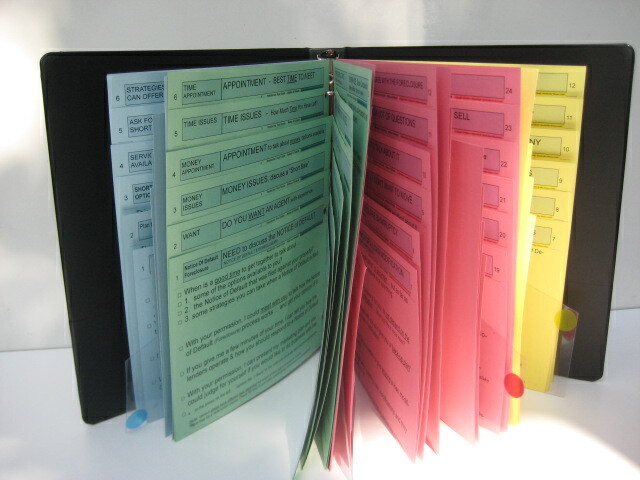 There are 12 pages of dialogue with many places for you to put your personal information. "30-Second Commercial" - aka: "elevator pitch" Profile of me & my company. 3 Reasons to Choose Our Referral Services. Guarantees - References - Affiliations. Why Meet With Me - Meeting Outline. 3 Reasons to Choose Me As Your Referral source. Benefits of Choosing Me As Your Referral Source. My Speciality. My Resources. Advantages of my / our referral network. Things that I can do better. Company Highlights - History - Facts. Presentation of My Referal Services. 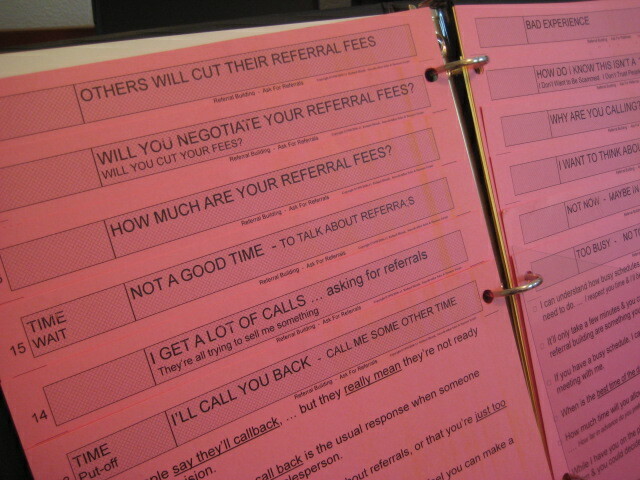 Referral sales scripts for calling to get new clients similar yet different due to their unique objection rebuttals & responses. Often in a referral sales script the actual words get glossed over. 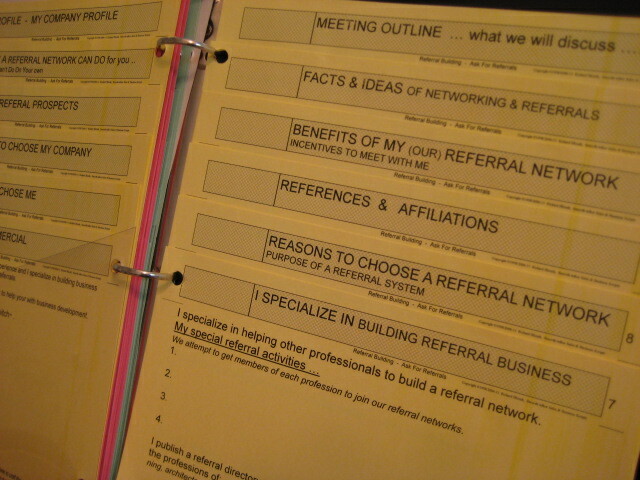 A referral networking script just adds the proper elements to every prospecting situation. 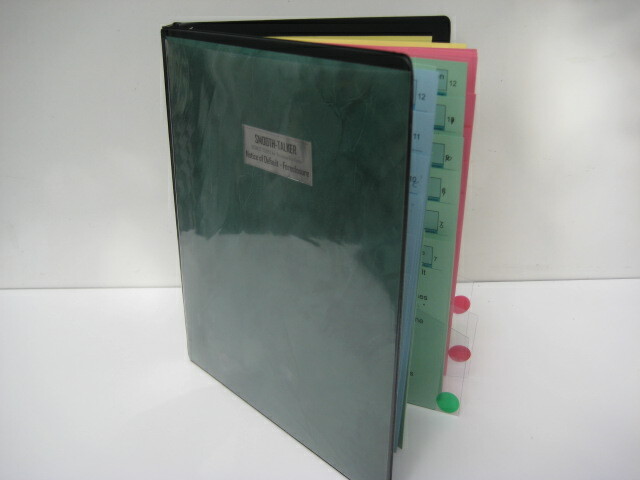 An up-grade to a "Genuine Leather" multi-ring binder is available for only $100. It is a classy and elegant addition to your prospecting tools. Anxiety about asking for a referral is just needless fear, worry, and doubt. Anxiety is fear based. Anxiety is worrying in the present about something bad happening in the future. It keeps sales people from reaching their potential. Worriers spend untold amounts of mental energy conjuring up bad things that could happen to them. The fears generated of something bad happening is far more powerful than it if it actually happened.